Do you want the SBI Clerk 2019 Online Application? Then, you are in right place. State Bank of India issued a Notification to fill 8653 Vacancies of Clerical Cadre Posts on regular and contract basis. The Online Application for SBI Clerk Vacancies will be available for Candidates for a short duration. So, Interested Aspirants has to Start the SBI Clerk 2019 Registration Process immediately to avoid last minute rush. Contenders must read the State Bank of India Clerk Official Notification before filling the SBI Clerk Online Application. The SBI Clerk 2019 Apply Online process and also the information required to fill the application is available below. 1.3 How to Apply Online for SBI Clerk 2019 Jobs? State Bank of India Clerk Notification is the good news for the Candidates waiting for Bank Jobs in India. As the 8653 Number of Vacancies is more, the number of aspirants applying for SBI Clerk Recruitment 2019 will be high. You must apply online for Clerical Cadre Jobs through our site or from official website www.sbi.co.in Check SBI Clerk Online Application form submission process. Before applying the candidates must be ready with all the information and documents required to fill SBI Clerk 2019 Application form. Applicants must satisfy all Eligibility Conditions such as Age, Education to apply for State Bank of India Jr Associate and Jr Agricultural Associate Posts. SBI Clerk Registration Process and SBI Clerk 2019 Online Application form Steps clearly explained. Name of Organization: State Bank of India. Name of Posts: Junior Associate/ Clerk Posts. 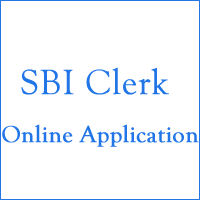 State Bank of India Clerk Application Mode: Online. Deadline for SBI Clerk 2019 Apply Online: 3rd May 2019. Candidates interested in applying for SBI Clerk Jobs has to pay SBI Clerk Application fee to complete Registration Process. SBI Clerk 2019 Fees varies for different categories and needs to be paid through online mode only. Various ways to pay the SBI Clerk 2019 application fee are Net Banking/ Credit Card/ Debit Card. On Successful completion of SBI Clerk 2019 Exam Fee payment steps, you receive a message about the payment of a fee. The candidate has to take a printout of e-receipt for future reference. Category wise fee details are available below. For General/OBC Candidates: Rs 750/- along with intimation charges. For SC/ ST/ PWD Categories: Rs 125/- with intimation charges. How to Apply Online for SBI Clerk 2019 Jobs? You must read 3Instructions carefully. Be ready with scanned copies of Photograph and Signature before filling the SBI Clerk Online Application. Open the SBI Clerical Cadre JA JAA Online Application Form 2019. Fill the SBI Clerk 2019 Application Form with correct Details. Make Payment of Fee and Submit SBI Clerk Application form 2019. Take Printout of Application of State Bank of India Clerk Exam. Fill Personal Information and Education details. Finally, Payment of Application Fee. This is the First Step in SBI Clerk 2019 Application Process. You must click SBI Clerk New User Registration. Fill the necessary details i.e. Name of the Candidate, Date of Birth, Email Address, and Mobile Number and Click on Submit. The User will be registered and the Registration Number and Password is provided to the User through Email and Mobile. Now you can log in with the Reg No and Password for completion of the application. The next step for SBI Clerk 2019 Registration Process includes Photo and Sign Upload. Candidates must follow Dimensions of Photo and also Signature mentioned in SBI Clerk 2019 Notification to upload. Therefore, the Second Step of the SBI Clerk 2019 Online Application is completed. Therefore, Applicants must fill details of all Education Qualification and Personal Information like Fathers Name, Marital Status, Address for Correspondance and more. If you are having Work Experience you may include it in the State Bank of India Application. Fill all necessary information and click on Continue. After successful completion of SBI Application, Aspirant should submit an application. Before Submitting, once check all the details provided in SBI Clerk 2019 Application form. Now, page redirects to the Payment of application fee. Pay the Fee through online payment gateway such as Credit Card/ Debit Card/ Net Banking. Upon Successful completion of the payment, e-receipt is available for the applicant for further process. Candidates should be ready with Scanned Copies of photo, signature. The scanned copies of images should be in jpg/jpeg format only. Photo image should be 10KB to 20KB. Starting Date for Submission of Online Application: 12th April 2019. Last Date for Submission of SBI Clerk Online Application: 3rd May 2019. SBI Clerk Preliminary Exam Date: June 2019. Candidates must be very careful while submitting the SBI Clerk Online Application as after final submission editing of the Application is not possible. After the successful completion of SBI Clerk 2019 Online Application form Submission, you can begin the preparation. Since the SBI is a Bank Exam, you need to face the toughest competition in the exam. So, refer the Syllabus and Exam Pattern and then download the SBI Clerk Previous Papers.